Once again I find myself compelled against reason to score Cotuit Kettleer games with my trusty spiral-bound faux-red leather covered C.S. Peterson’s Scoremaster: Official Baseball and Softball Scorebook. While I feel self-consciously nerdy and obsessive doing this in public, I find I can’t enjoy a three-hour ball game without making little chicken scratches on a paper grid. Nothing comes from it. No results are tabulated, statistics calculated, or reports issued. The only pleasure comes from knowing the record is accurate, the tallies correct, and every so often I’m able to answer a random question from a fellow fan in the bleachers about how many pitches the pitcher has thrown, or what the batter has done in his previous plate appearances. Typical Churbuck scorecard from 2010 showing Devin Marrero, the Red Sox’s top draft pick in the 2012 draft hitting a double in the sixth inning vs. Wareham. And yes, when I go to Fenway the scorebook comes with me, and I always dutifully tape the ticket stub to the pages for that game. I see more scorers at Fenway than I do at Kettleer Games. Arnold Mycock, the general manager emeritus, scores from the stands sometimes, using the free Kettleer scorecards they hand out at the press box. Because of his eminence he is also handed a copy of the lineups before the game, something I wish I could get because getting the lineups down correctly is half the battle. As I have written here in the past, baseball is a sport uniquely suited to scorekeeping, because the pace and rules as well as the statistical tradition of the game lends itself to being recorded with pencil and paper better than any other sport. One can simply tick off hits, outs, and runs, or one can get very focused and record where hits landed, where pitches were placed, how many pickoff throws the pitcher made, how many fouls were hit …. the output of all this record keeping is the raw data necessary to calculate key statistics such as batting average, runs batted in, earned-run average, and many many others quantitative measures made more popular in this era of Sabermetrics and Moneyball. It used to be the case that the average fan in the stands would score games. I’ve heard people reminiscence about their spinster aunt sitting in the back yard on a hot summer day listening to Curt Gowdy call a Red Sox game and keeping score while sipping lemonade and swatting mosquitoes. Find an old black and white photos of the crowd at the Polo Field in New York, or Forbes Field in Pittsburgh, all natty in their fedoras, the men wearing ties, the ladies little hats, and there is a blizzard of white score cards. 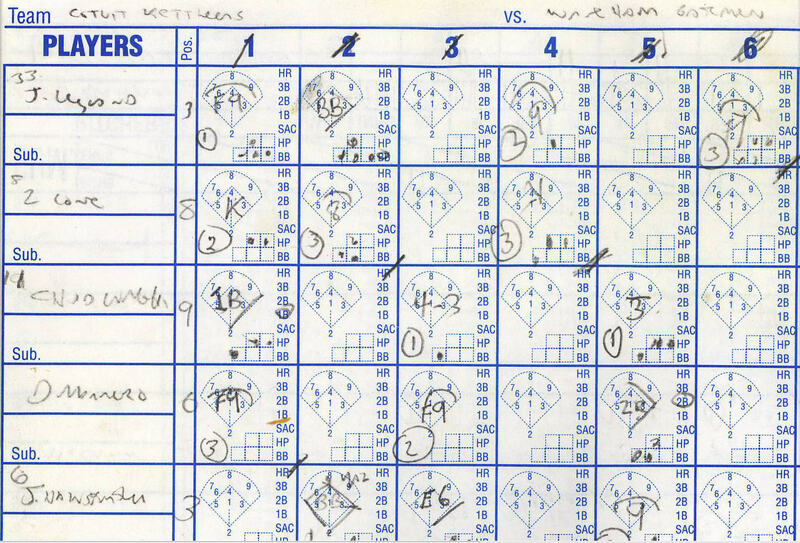 In the old days, when scoreboards were manually updated and only showed the inning-by-inning box score (runs, hits, errors), a fan relied on their scorecard to tell them how the batter at the plate had fared at his previous two plate appearances, or which fielder booted the ball and earned an error in the fourth inning. 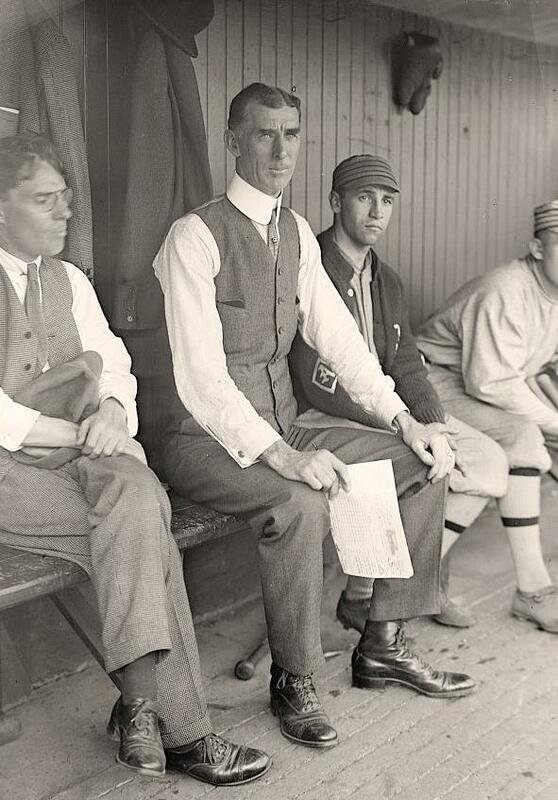 Connie Mack famously used his scorecard to send signals to his fielders. The statue of him in Philadelphia has him waving a bronze one eternally in the air. Today I only occasionally spot a fellow scorer. My theory is the practice died off with the rise of the Jumbotron and the instant availability of stats and replays and other data on the big outfield monitors. It’s been said that a good scorecard should be able to be handed to a person with a reasonable knowledge of the game and on its own provide all the information needed for that person to recreate the action in their mind — inning by inning, pitch by pitch — of the entire game. The ultimate test of a good scorer would be his ability to capture the precise conditions there were on the field at the moment that game was suspended so, in the future, the game could resume with every player in their proper spot, standing at the same base they were when the game was suspended, the batter facing the same count of balls and strikes. My scorecards are nowhere close to passing that test for I am usually in a state of befuddlement by the act of scoring despite having done it now at least 100 times. My motto is: Thank god for pencil and erasers. The rules of baseball are extraordinarily explicit about the duties of the official scorekeeper and the information that person is expected to record. The tenth, and final section of the official rules are devoted to the Scorekeeper. Twenty pages of the rules are devoted to the scorekeeper. Those rules set down the 50+ pieces of information the scorekeeper must record ranging from the names of the umpires to the duration of the game to the names of the batters who hit home runs when the bases were full (Grand Slams). Some of the rules are quaint, such as specifying that the scorekeeper shall sit in the press box and not on the home nor visitors sides of the stands to insure impartiality but also to provide members of the press with information throughout the course of the game. The rules say the scorekeeper is supposed to remind the umpire when there are only two outs but the players think there are three but the scorekeeper has to keep his mouth shut if a batter bats out of order, because it’s up to the opposing team’s coach or players to detect the infraction and protest. Scorekeepers have 24 hours to change their mind on a play. They can solicit the opinions of others in deciding what to record. But for all the rules governing the art of keeping score, there are no standards for what an official scorecard should look like, nor are there any official shorthand conventions for how to record and track the play-by-play action — hence a scorecard can vary from one scorekeeper to another. Some are personalized with little diagrams, exclamation points to signify extraordinary plays, notes about the wind, the temperature …. The big challenge for me is paying attention to what is happening on the field while at the same time tending to my scorecard. If I get too engrossed in the card then I am doomed to miss the play and find myself marking the card with a big “?” or asking those sitting around me for a clue as to what I missed. While everyone around me high-fives and claps I sit down, click out another millimeter of pencil lead from my automatic pencil, and start scoring. From that version of events (as witnessed by me like some undependable postmodernist existential narrator in a Kurosawa film or Thornton Wilder novel) I then have a few seconds before the next batter to record the play. I decide the batter standing on second base got there on an error committed by the right fielder because the right fielder’s throw to the catcher was wild and there was no way the catcher could have caught it. So the box for that batter gets marked with a big “E9”. That means the poor batter gets no credit for the double and no credit for the two runs batted in because he made it to base because of the error. The pitcher doesn’t get an earned run charged to him because of the error. Check. The base runners who scored both get marked with credits for their runs. All of this is being done with symbols and shorthand-like slashes of the pencil. Each batter and base runner has their own tidy box containing a diagram of the diamond. Every defensive player is referred to by a single digit — one through nine, beginning with the pitcher who is “1” to the catcher who is “2” on around the infield and into the outfield and ending with the right fielder who is “9” (never to be confused with their uniform number. Scorekeepers refer to players by their field number only as in saying “That was a 1-2-3 doubleplay” which translated means the pitcher (1) was quick and caught the line drive on the bounce, threw it back to the catcher (2) to force out the runner coming home from third, and the catcher tossed it to the first baseman (3) in time to catch the original batter trying to make first base. If you think Laurel and Hardy’s “Who’s On First Routine” is fun, try scoring and getting it through your thick skull that the first baseman is actually a three, not a one, etc. Guess what Wirkmaa’s day job is? That’s right: he’s a lawyer. Last week the Cape Cod Times had a story about dog owners pissed off in Brewster because the selectmen banned their pooping pets from the town green. One of the rabble-rousing dog owners fighting the ruling is a New York lawyer named Jordan Sprechman. What caught my attention was the background information that this New York attorney is also an official scorer Major League Baseball. In other words, a Scorekeeping God. “About twice a week during baseball season, he heads to the press box at Yankee Stadium or Citi Field, where he calls errors and hits. In his small script, using all capital letters, he tabulates the statistics at the end of each game for Major League Baseball. “He’s used to taking heat. I want to know how one rises to the top of the Scorekeeping Ziggurat. Is there a Society of Baseball Scorers I don’t know about? A test? An apprenticeship? And so I slowly rise, brandishing my trusty C.S. Peterson’s Scoremaster: Official Baseball and Softball Scorebook, and finally get a seat in the press box. This will not happen for the simple reason that I have a long long way to go before I can be trusted to properly record a game. For scorekeeping is not a batter of just counting and writing, it’s about judgment calls, opinions, subjective decisions that will piss people and players off if done poorly. My scorecards are a record of doubt, second guesses and erasures, committed in crazed handwriting that even I can’t decipher. I still don’t know how to credit a winning pitcher or how to give a pitcher a save. Despite my membership in the Society of American Baseball Research, and my ownership of a Strato-matic set, I do not understand WAR or PECODA. As my friend and ardent Yankee fan T. Grand once replied on Twitter when I tweeted my ignorance of the infield pop fly rule during a Red Sox game : I would have been shot as a Nazi spy in World War II for my un-American ignorance of the fine points of the rules, for the greatest test of red-blooded Americanism is knowing one’s baseball rules. Whatever, I can always hope to improve.